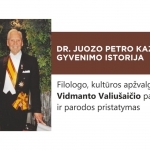 On April 15th Siauliai region Povilas Visinskis Public Library is inviting all to the opening of the exhibit "Dr. Joseph P. Kazickas' Life Story" during which culture, history reasearcher and linguist Vidmantas Valiusaitis will present the talk. Dr. Joseph Peter Kazickas – philanthropist, patriot, entrepreneur, dedicated father, intellectual, world traveler, writer, orator, historian who cared for Lithuania, its Freedom, its People his entire life and lead his life by the motto: "Life only has meaning when one is sharing good fortune with others and contributing to a better life for everyone!" 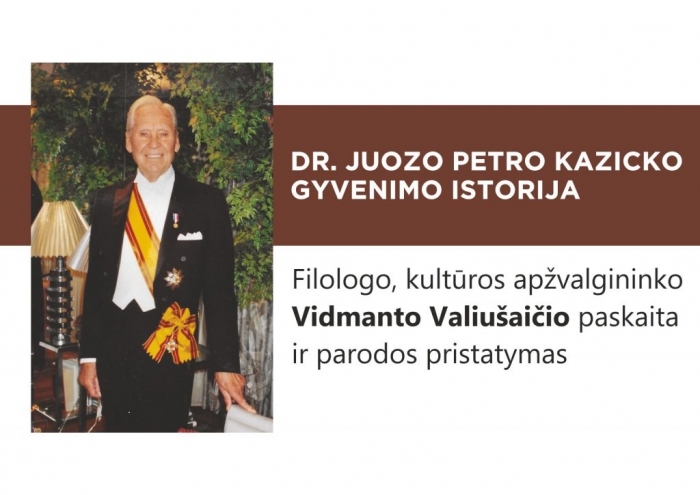 Siauliai Public Library is inviting all to learn more about the Kazickas Family Foundation, Joseph and Alexandra Kazickas, dr. Joseph Kazickas and his life, as well as to observe short video helping to understand better dr. J. Kazickas' philosophy of life. Event organizers Siauliai region Povilas Visinskis Public Library and the Kazickas Family Foundation. The Kazickas Family Foundation and Siauliai region Povilas Visinskis Public Library are inviting all school students from Siauliai area to create exlibris based on "Odyssey of Hope". Students' work will be introduced to the public on April 15th at 5 pm at the P. Visinskis library during the opening of the "Dr. Joseph P. Kazickas Life Story" exhibit. While making exlibris we invite students to analyze the importance of never giving up, no matter what challenges life offers and never giving up hope while reaching for your goals. We hope to inspire young participants to find their fearless dreams and to reach for them. This year the Kazickas Family Foundation, founded by Joseph Kazickas, marks its 20th anniversary. As President of Lithuanian Valdas Adamkus said: "He wished with his heart and souls to see Lithuania rise from the economic poverty left by the soviet times, even more so - from the soviet mentality. He longed to see Lithuania's youth to start believing in new Lithuania with new opportunities, - that's the reason why he supported the Universities, gave scholarships, funded cultural, science and sports initiatives." For the last 20 years KFF has been working on this mission. After Joseph and Alexandra's passing, their children and grandchildren led by the president of the foundation Jurate Kazickas, continue their legacy. Exlibris initiative authors who will be helping with the project – Book graphics center (KGC), department at Siauliai region Povilas Visinskis Public Library, working on spreading the knowledge about book graphics and organizes exhibits, various educational and publishing activities.